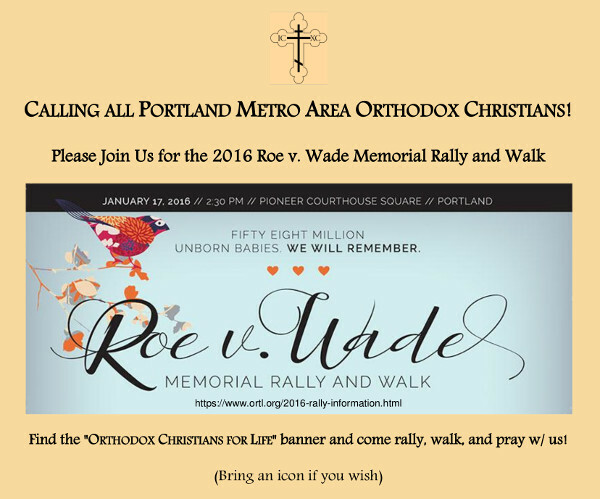 The 2016 Roe v. Wade Memorial Rally and Walk will be taking place on January 17th, 2016 at 2:30 PM at the Pioneer Courthouse Square in downtown Portland. This is an excellent opportunity for local Orthodox Christians to join the greater Pro-Life community in solidarity for the sanctity of Life. We invite you, your family, and friends to attend this important event and remember the 58 million innocent lives lost to abortion. Come Rally, Walk, and Pray with Us! This entry was posted in Uncategorized and tagged memorial, rally, Roe v. Wade, walk. Bookmark the permalink.